Question: How can you play a part in creating the next generation of scientists, veterinarians, horticulturalists, managers, pharmacists, philosophers, pilots, engineers, astronauts, and teachers? Become a teacher in Indiana and beyond. 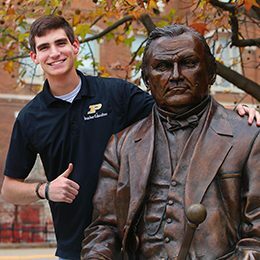 Purdue University offers 15 different teaching majors. Get your degree to become a teacher and play a part in inspiring generations to come. Your journey begins here. At Become a Teacher Day, you can learn more about the exciting profession of teaching, get to know Purdue’s campus, and participate in fun campus activities with current Purdue students. The next Become a Teacher Day will take place on April 11, 2019. RSVP now! Teaching is a challenging yet rewarding career. Take advantage of the opportunity to make an impact on the lives of young people. What do you want to teach? We offer 17 teaching majors across six different colleges. Demand for K-12 teachers is growing.